Collaborative play, also known as social play and cooperative play, is a type of play that typically begins at around 2 years of age when toddlers are mature enough to begin taking turns with playmates, sharing playthings, following rules, and negotiating with others — for instance, offering a playmate their Superman toy for their playmate's Winnie the Pooh toy. Up until this point, toddlers engage in parallel play: when children play near each other, not with each other. 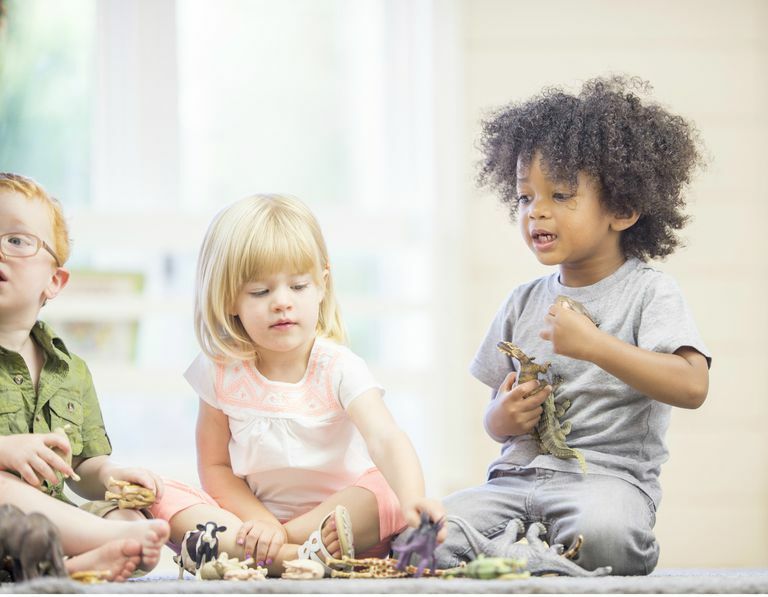 The characteristics of collaborative play aren't just niceties that show a child is beginning to realize they aren't the only person in the world. This type of play teaches important social skills that help children grow during everyday play. In collaborative play, children solve a problem by working together to reach a common goal. Unlike competitive play that involves clear winners and losers, everybody wins in collaborative play. Play is an extremely important part of development. It's how children learn. Play develops the skills children need to advance their emotional, social, physical, and cognitive abilities. As children grow, they may not necessarily progress through the different types of play in a linear fashion. In fact, they will likely engage if different kinds of play depending on their own personality and play environment. Sharing: To help teach your child about sharing, use the term "share" in its truest, most accurate sense: that is, collaboratively. Asking your child to "share" a cookie that they'll never see again will only lead them to assume that when they share a toy, they'll never get that back either. Taking turns: It takes a great deal of impulse control for a young child to be able to give up something they want now and wait. Start small by taking turns rolling a ball back and forth, which will help your toddler understand that they will get a chance very soon. Obeying rules: One of the best ways to teach toddlers about rules is to not let them win all the time. It may frustrate your little one sometimes and it may seem a bit cruel, but it's a good way to introduce the fact that all games have rules and everyone needs to follow them. Teamwork. Encourage collaboration over the competition by emphasizing the advantages of teamwork. Your little one might not be old enough to help with household chores, but you can promote collaborative behavior by picking up toys together. Negotiating: This is a skill that is best learned through modeling. Give your child a cracker and reach for their slice of cheese. It will take a while for a child to understand the give and take, but eventually, it will become ingrained and be put to the test on the playground.